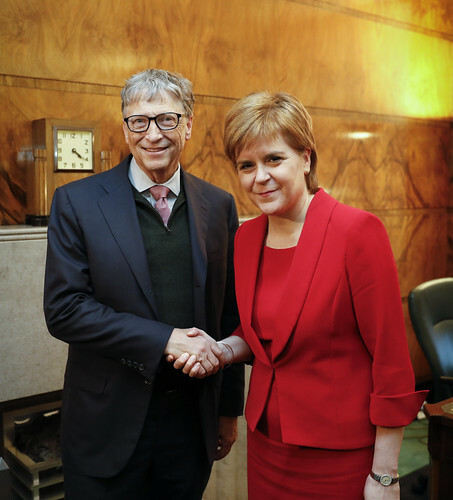 First Minister Nicola Sturgeon welcomed Bill Gates to St Andrew’s House to hear first-hand about some of the work being carried out by NHS Scotland staff as part of our commitment to global health. They watched a presentation on three different global health initiatives undertaken in Zambia, Ethiopia and Malawi, and how the dedication and expertise of NHS Scotland staff has been used to help improve health outcomes in developing nations. The meeting was chaired by Dr Catherine Calderwood, Scotland’s Chief Medical Officer, and also attended by Dr Alasdair Allan, Minister for International Development. I was delighted to welcome Bill Gates to Scotland and to introduce him to some of the fantastic international development work being undertaken by our NHS Scotland staff. I am grateful to each and every one of our nurses, clinicians and even engineers, who often give up their own time to do this life changing work. Scotland is an outward looking country and we will continue to be good global citizens and play our part in the fight against global poverty, inequality and injustice. That is why we have built strong links with our partner countries Malawi, Rwanda, Zambia and Pakistan, with a strong commitment to working towards achieving the UN Sustainable Development Goals.